Elegant, clip-on tartan braces in fine dupion silk. Wear everyday or as discreet tartan evening accessory. Great gift with unmistakable Caledonian style. Available in over 70 silk tartans. Or also see selection of 400 other tartans available in 100% Wool. 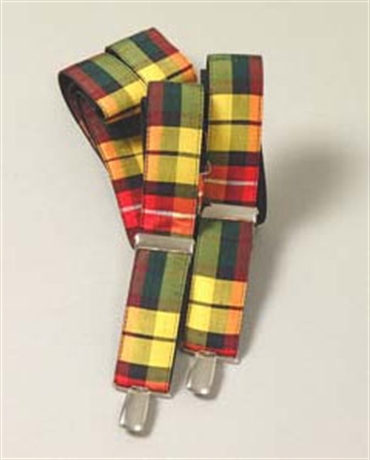 Elegant, clip-on Tartan braces (Suspenders) in fine dupion silk. Wear everyday or as discreet tartan evening accessory. Great gift with unmistakable Caledonian style. Available in over 70 silk tartans. Or also see selection of 400 other tartans available in 100% Wool. Crisp Dupion Silk tartan braces. Fully adjustable, with stylish, durable Nickle closures.